Gait impairment and fatigue are common and disabling problems in multiple sclerosis (MS). Characterisation of abnormal gait in MS patients has been done mainly using observational studies and simple walking tests providing only limited quantitative and no qualitative data, or using intricate and time-consuming assessment procedures. In addition, the correlation of gait impairments with fatigue is largely unknown. The aim of this study was to characterise spatio-temporal gait parameters by a simple and easy-to-use gait analysis system (GAITRite®) in MS patients compared with healthy controls, and to analyse changes and correlation with fatigue during inpatient rehabilitation. Twenty-four MS patients (EDSS <6.5) admitted for inpatient rehabilitation and 19 healthy subjects were evaluated using the GAITRite® Functional Ambulation System. 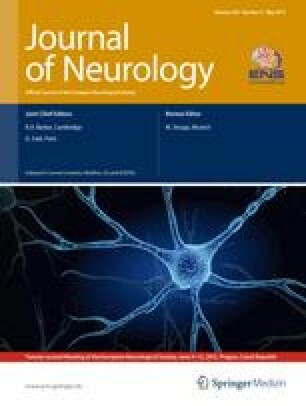 Between-group differences and changes of gait parameters during inpatient rehabilitation were analysed, and correlation with fatigue, using the Wurzburg Fatigue Inventory for Multiple Sclerosis (WEIMuS), was determined. Compared to healthy controls MS patients showed significant impairments in different spatio-temporal gait parameters, which showed a significant improvement during inpatient rehabilitation. Different gait parameters were correlated with fatigue physical score, and change of gait parameters was correlated with improvement of fatigue. Spatio-temporal gait analysis is helpful to assess specific walking impairments in MS patients and subtle changes during rehabilitation. Correlation with fatigue may indicate a possible negative impact of fatigue on rehabilitation outcome. This study was supported by the Horst Kübler Stiftung. We are grateful to all MS patients participating in this trial.